Kristina, who is 8 years old, hand stitched this beautiful diamond, # 121, from Quilted Diamonds: Jane Austen, Jane Stickle & Friends. Kristina's mother, Linda, is a member of a weekly Quilted Diamonds group in Texas, and Kristina has started going to the bees too. The leader, Tricia Autry, encouraged Kristina to try a diamond of her own, and since Tricia has the Quilted Diamonds CD, EQ5, and a large format printer, she was able to print the pattern in a larger size. 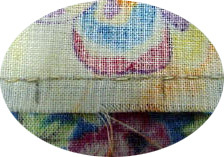 Tricia says, "Kristina's stitches are very small, AND very even! Her stitching is even better than many adults! She made her diamond 10 inches wide, by 17.5 inches long, so she had to do quite a bit more stitching than most of us do on our diamonds. Her mother also helped her "fussy cut" her pieces, so the effect is even prettier than most. And the Butterfly / Bird fabric came out of Kristina's OWN stash -- she had seen the fabric at a local quilt store, and just had to get some to have on hand for a special project. Kristina has her second diamond all ready to work on!" Her mother says, "She is so pleased with herself that now she is talking about making ALL the diamonds. I think her Dad gave her that idea. He told her if she made enough she could make a quilt." Kristina and her cousin, Megan, with diamonds! 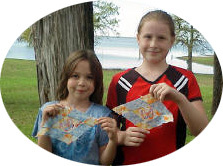 When Megan saw Kristina's first diamond, she wanted to learn to quilt too. They picked QD # 154 and they each put a butterfly in the center. 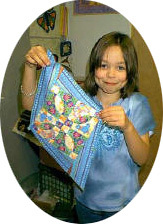 Tricia printed their patterns 5.71 x 10 inches with EQ5 and the QD CD. This was Megan's first time using a needle and thread. She is 10 and Kristina is 8. They are learning very fast, and they are going to have wonderful memories of Spring Break this year! Update! Kristina has finished QD # 175! She should be very proud of herself! Even the back side is pretty! 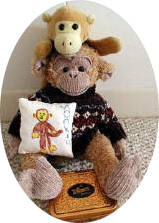 Since we last updated the page, Kristina has joined her mother's quilt guild, too.